'Melco' stands for Maki Engineering Laboratory Company - now you know! Unlike PC based systems, all Melco's have a dedicated PLAYER port. This allows connection directly to the network Streamer or Player without any data switch in the signal path which would damage the music data. 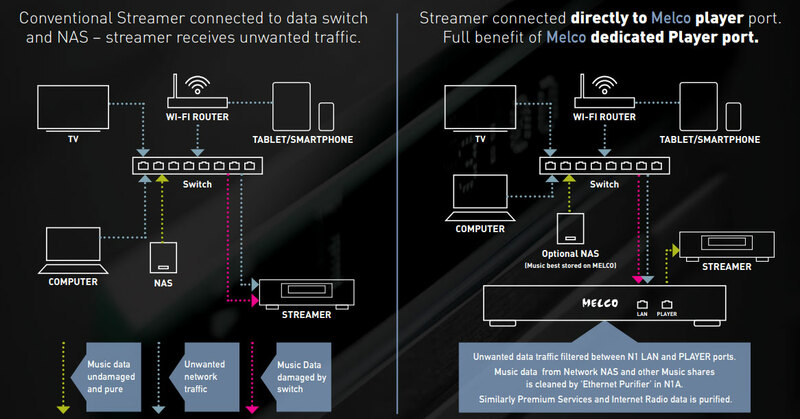 This direct connection concept Melco call Direct Streaming Music – DSM – and it is unique to Melco as is the Ethernet purifier between the LAN and PLAYER ports. These technologies employed within Melco's DSM ensures that your player receives only clean and accurate data, all packets are timed with low-jitter precision and all unwanted traffic is blocked, even the LAN lights can be disabled for highest possible data integrity. There are two methods of operation – Network Mode is the default and allows a tablet connected to the Wi-Fi to control the player as normal. But for ultra-pure music playback DIRECT MODE can be selected – in this case there is no need for any external Ethernet or IT components, and the Melco acts as DHCP server to the player, under these conditions all browsing and control is then from the player front panel. 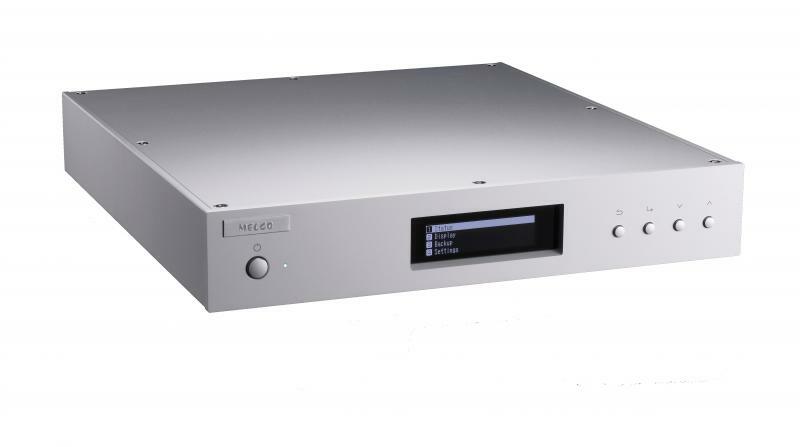 The Melco N1ZS represents Melco's best performing reference Digital Music Library. Melco N1Z/2 is the flagship of the new Mk2 series. True audiophile source components designed for both Ethernet connected Players (Streamers) and for connection to a USB connected DAC. The N1Z/2 is constructed as a true Hi-Fi source component with heavy anodised aluminium chassis sections bead blasted to a delightful finish, and with an internal rigid H frame to isolate vibration and isolate the various sections of the hardware. The Melco N1ZH retains all the features of Melco's flagship model, the N1ZS but is fitted with 2 x 3TB HDD giving more storage at a more affordable price. The Melco N1A is where it all started, the MK2 model is a development of the N1A to further improve sound quality especially for USB-DAC users incorporating a dedicated Neutrik USB 2.0 port for DAC connection for optimum sound quality. Internally there are many detailed improvements to further reduce internal noise including a new capacitor bank to isolate the medical grade power supply, a new higher current 3 pole IEC connector with true ground and a built in power supply noise filter. Newly selected HDDs with vibration isolating cradles ensure a new low level of vibration combined with capacity increase (2 x 3TB). A front panel USB 3.0 port makes importing from USB stick or USB drive very convenient and is in addition to the 3 rear USB 3.0 ports for Easy Backup, Easy Expansion, Easy Play and Easy import. 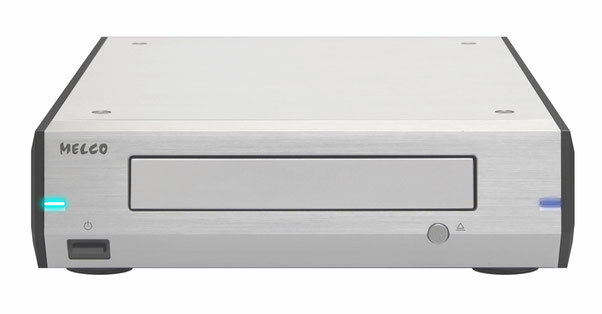 The Melco D100 uses the most recent generation of optical drive technology which reads CD's with great precision. The Melco branded circuit board is optimised from an audiophile point of view to promise the highest quality transport and ripping of CD into N1 range. It can be turned off with the dedicated power switch and is built into casework using the same concept as most recent Melco music library products. Melco Highly Stable Storage System holds the whole drive mechanism stable when in use. Perfect for ripping your cherished CD's onto your new Melco! 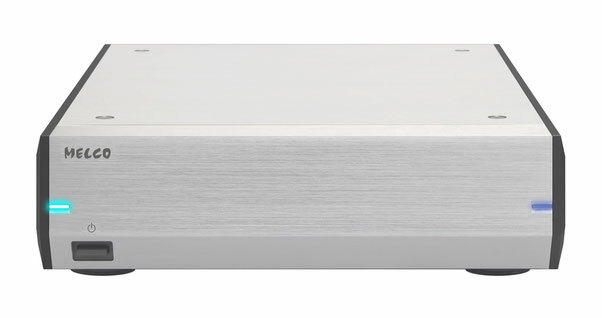 The Melco E100 is the perfect solution to add to your N1 or similar digital music library storage by a further 3TB HDD. The Melco branded circuit board is optimised from audiophile point of view to maximise data retention and retrieval. To host USB type B port is for any N1 range or PC to read the disk data. To device USB type A port is for USB-DAC playback with any N1 range USB local playback function.